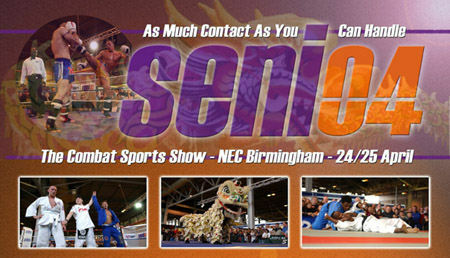 SENI is Europe’s premier trade exhibition and live event dedicated to the Martial Arts and Combat Sports industry. It takes place at Birmingham NEC on 24th and 25th April 2004 and TORQ are going to be there promoting the new ‘TORQ Fitness Challenge’. This may sound like an unusual departure from the usual ‘cycling’ ethos of TORQ, but having personally worked for Men’s Fitness magazine for a few years now and having my roots firmly established in fitness instruction and personal training – it aint that weird! TORQ are going to SENI and Birmingham NEC to test the fitness of the nation’s Martial Artists, Combat Enthusiasts… and anyone else who wants to rise to the challenge. And as TORQ Performance Consultancy is dedicated to endurance sport, this is a cardiovascular/aerobic challenge with a few enduring body-weight exercises thrown in for good measure. It’s designed to test all-round fitness, but if you’re built only for power, forget it – it’s not a challenge for you. * The higher you set the bike’s resistance setting, the harder it is, but the quicker you’ll get there. The clock starts when you heave your first row and stops on your final grapple and the fastest time wins. There’ll be prizes up for grabs for both male and female competitors in all age groups. So, whether you’re into the Combat thing or not, why not come along to Birmingham NEC on 24th or 25th April to test your physical fitness? Of course, we’ll be selling TORQ bar and other TORQ products with a special show discount to.